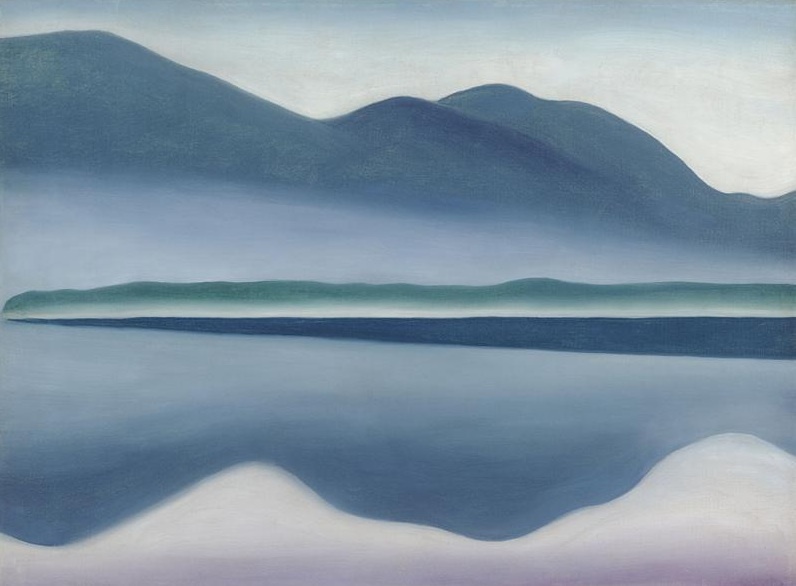 San Francisco’s DeYoung Museum is showing “Modern Nature: Georgia O’Keeffe & Lake George” through May 11. It’s early work, before she got into her iconic western stuff. It’s odd. It’s irregular. Much of it, like “Lake George Coat and Red” is harsh, vulgar, and unpleasant (although to be fair, the original is somewhat more coherent than this photo). We tend to associate modernist painting with free-wheeling brushwork, but O’Keeffe worked with a pretty small brush, carefully gradating each shape from dark to middle tones, seldom to light. I find little evidence of exploration or experiment as the work progressed. She seems to have worked it all out in her mind before starting: what’s going to happen, where it’s going to go, what it’s supposed to mean. The effect is like being lectured to by a very stern pedagogue. interesting stuff. 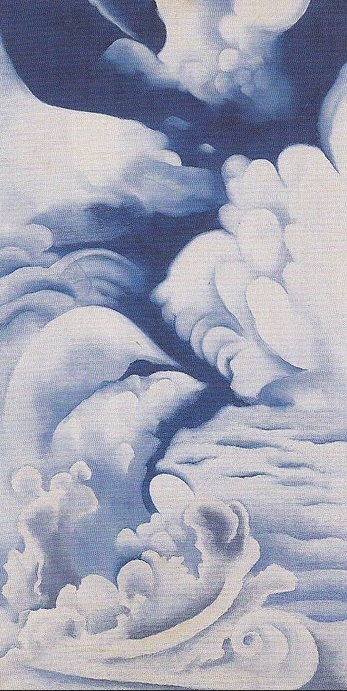 “A Celebration” seems to come from actual observation, from looking at clouds and responding to the shapes. “Humble” is an odd word to apply here, but it applies; she’s sharing her delight in something wonderful, not laying down the law about it. “Lake George” produces much the same effect. It’s a tad washy, just a scootch wandering, but the effect is fine: reserved and contemplative. 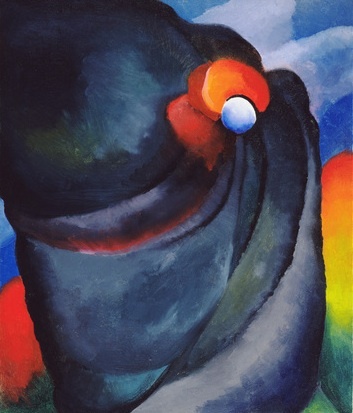 Then we come to one of the strongest, most carefully observed and formally inventive pieces, “Lake George Window.” Here O’Keeffe is very decisive, very masterful, but the piece is so inventive, so frankly lifted from reality, and lifted so far, that you can almost hear her chuckling as she laid it in. 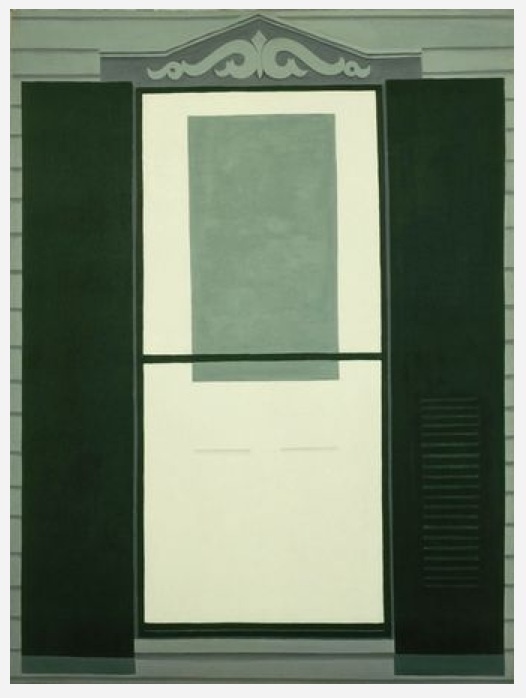 And yet–and yet–the paint is laid down carefully but not quite carefully enough as she worked up to the edges of those large rectangular shapes. The strokes come down each side of each shape, a little wandering, a little insecure. The way she paints, these bobbles aren’t expressive. She doesn’t mean them to be expresseive. They are merely weaknesses, distractions, mistakes. But clearly she isn’t going to be drawn into anything that looks like vagueness or suggestion, where she might in some tiny degree lose control of the message. The pedagogue is still in charge, however subtly.